WEI Honored as the NMSDC Supplier of the Year! As a minority-owned business in Salem, NH, it has been a core tenet of our culture to embrace diversity in the workplace and support diversity in our community. 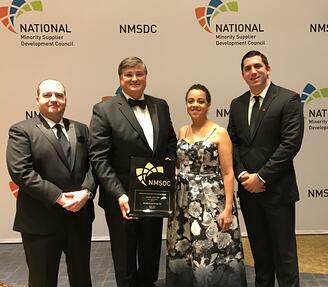 Last week, at the National Minority Supplier Development Council Annual conference (NMSDC), WEI received the National Supplier of the Year award in the class IV category! This highly coveted award helps solidify our position among an elite group of minority-owned businesses who are making a substantial effort in promoting the success that can be achieved when working with diverse suppliers. A special thank you is owed to Blue Cross Blue Shield of Massachusetts for nominating WEI for this distinguished honor; and also to CVS Health, who welcomed our company into their very own booth at the conference exhibition to illustrate the success that is possible when working with a minority-owned business that shares mutual corporate values. WEI also recently attended the NMSDC Conference and Business Opportunity Exchange, the nation’s premier forum on minority supplier development. The NMSDC organization sets out to celebrate minority and women-owned businesses that are making great strides in the global corporate supply chain. The conference spanned four days and included more than 6,000 diverse suppliers nationwide spanning from corporate CEOs, to procurement executives and supplier diversity professionals. The annual conference provides an opportunity for business leader and diverse suppliers to network, share intelligence, and focus on four key areas: Certify, Develop, Connect and Advocate. WEI is proud to be a top national technology solutions provider with a commitment to supply chain responsibility, minority empowerment, and environmental and social responsibility. We were also recently named the 2016 Supplier of the Year by the Greater New England Minority Supplier Development Council (GNEMSDC). Our clients benefit from a strong focus on customer satisfaction and attention to detail. We combine new technology with architectural design, value-added services, onsite training, integration, testing labs and a commitment to quality. To learn more about our cutting-edge technology solutions, click here to view our video. You can also learn more about what the NMSDC had to say about this year’s Supplier of the Year award nominees here. As always, we remain committed to our clients and help them solve business problems every step of the way. Contact us today for details.